The results of a new study by public health researchers at Columbia University and Oxford University forecasts that by 2030, there will be an additional 65 million obese adults living in the U. S., and 11 million more in the U.K. That would bring the U.S. obese population up from 99 million to 164 million, roughly half the population. The study, published in the Aug. 27 issue of The Lancet, was led by Y. Claire Wang of Columbia’s Mailman School of Public Health. 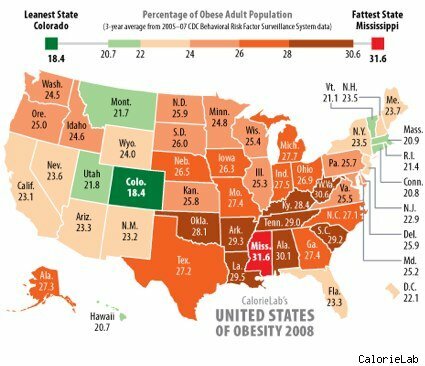 From Slash Food comes this map of obesity rates by state. 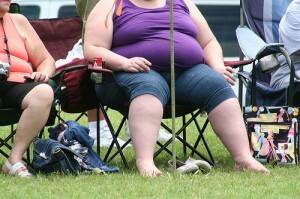 Currently, roughly one-third of Americans are obese. Any guesses as to what this map will look like in 2030? Prevalence of obesity among men would increase from 26% to between 41 — 48%, and among women from 26% to 35-43%. In the U.K., annual spending on obesity-related health would increase even more rapidly than in the U.S. due to its older population, rising 25%. Now, maybe I’m being naive, but I refuse to believe that within 20 years, half the U.S. population will be obese. Here’s to hoping this is one prediction that doesn’t come true. Tags: Columbia University, Disease, obesity, U.K., U.S. If you cut off the medical spending for these conditions it will not only help the budgetary problems, but also reduce the proportion of the population who are obese at the same time. I call that a win win. 50% seems way too much. I would like to know how they got these numbers. Do they just assume that obesity is going to continue to rise for the next 20 years at current rates? It would seem likely at some point that the rates will plateau at a constant level. There are always going to be people who exercise, eat healthy and make an effort to lose weight so the rates can't go up forever. I think the situation resembles something like this XKCD. Just because the trends are increasing now doesn't mean that trend wont' change in the future. What method is being used to signify obesity? The questionable measurement of BMI or a truer measure like body fat percentage by a reliable testing method? They use BMI, which was invented in the mid-1800's and doesn't apply to normal human beings now that half of us aren't malnutritioned. Are people fatter these days, probably yes, but I have no clue based on BMI. BMI only exists now as an excuse for insurance companies to raise your rates. agree with Mike on this one. Your life choices have a major impact on healthcare costs for the wider (no pun intended) system. I have no problem not covering these expenses. Genetics and other preconditions aside, obesity is a result of personal decisions. A lot contributes to obesity that goes beyond poor willpower. In fact recent studies have shown that willpower actually decreases with blood sugar levels so people can find themselves in a catch-22 where the only way to resist eating is to eat more. Don't forget that the only food low income people can afford tends to be the least nutritious and most unhealthy and since smoking was vilified there are few other inexpensive ways to stimulate endorphin production (and none I can think of that actually suppress appetite). Still, cutting off the obese from subsidized medical care that enables their obesity is not an issue of fairness it is an issue of absolute necessity. There simply won't be enough resources available to keep them from not dying. Something needs to be done to solve the problem and scolding people to eat less isn't working. Mandatory procedures like gastric bypass or new types of pharmaceutical could provide efficient methods of controlling weight for obese persons covered by public and private insurance, but those unwilling to shed the pounds could no longer be tolerated. Brilliant, the death penatly for being fat. Do we get a trial first? Incidentally, there is no such thing as "obesity related" non fat people get the same conditions, including type 2 diabetes. Since when is anyone entitled to have their medical care fully covered by society? If you want to be fat and pay for your own dialysis go right ahead, but your fellow taxpayers or fellow insurance premium payers should not have to pay for your life choices. Maybe in the past it could be overlooked, but if half of the population is obese then both our fiscal situation and our healthcare industry will become completely untenable. A properly functioning health insurance market would help alleviate these problems as you wouldn't have the healthy massively subsidizing the unhealthy. Insurance is for pooling risk, not redistributing resources. Every year our office pays out $90,000 in health insurance premiums and takes in around $20,000 in benefits. Of course we are a bunch of fit active employed middle-aged people. Why we should be forced to pool risk with fat people, the aged and smokers is beyond me. Another thing that would really help is taking some steps to reduce driving. I gave up driving for trips under 10 miles a few years ago (I bicycle instead) and it has done amazing things for my health. We make it too easy to eat too much and exercise too little. As a result, people eat too much, exercise too little and get fat. Time to make it hard. Really hard. Since taking away someone's donut and sending tigers after them might be too heavyhanded, we should compromise and just shame them. Never mind the stigma against shaming! I would rather shame than have to claw my eyes out again! So if I want to look thin, move to MIssissippi, got it. "There is something fascinating about science. One gets such wholesale returns of conjecture out of such a trifling investment of fact." ---Mark Twain. The study is based on NO substantial new developments in anti-obesity medications or treatments. Since several meds are currently in testing, I doubt this is realistic. Simple solution used by Congress for decades. Change the standards for obesity. The title text: "By the third trimester, there will be hundreds of babies inside you." BUT, your map does NOT show a SINGLE state that has an obesity rate over 33.3%. Since most trends are self-limiting (that is, there is a maximum that is never reached but approached determined by the system itself), how do we know that 50% is that limit? Did the study simply extrapolate past growth? I, too, have trouble believing that 50% of the population will be obese but then I do live in Colorado. Not to worry at all. At some point NIH moves the obesity treshhold from BMI 30 to BMI 40 and we're all slim and fit again! Voila! I do wish you folks would learn the proper use of the plural pronouns. Your future may be fat, mine won't be. « Previous PostThe Music Industry Copyright Battle: When is Owning More Like Renting?